This re-release marks the production of the opera at the Savonlinna Opera Festival in July 2014. Previously relased as ODE 780-3T. 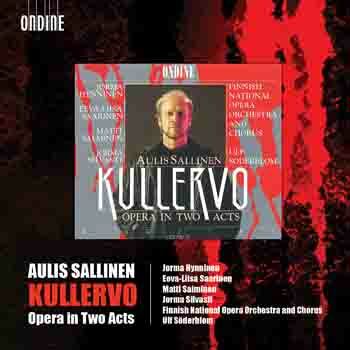 This triple CD contains the two-act opera Kullervo by Finnish composer Aulis Sallinen who also wrote the libretto. Derived from the Finnish national epic Kalevala and from the play Kullervo by Aleksis Kivi, it tells the story of the magician Kullervo, the ill-fated son of Kalervo and the only irredeemably tragic character in Finnish mythology. Sallinen wrote his fourth opera between 1986-1988 on commission from the Finnish National Opera. Prior to the world première - which took place in Los Angeles in February 1992 with the Los Angeles Chamber Orchestra and the Finnish National Opera Choir and soloists lead by Ulf Söderblom - this recording was produced in Helsinki in collaboration with the Finnish National Opera and in the presence of the composer in September 1991.